Mobile training labs lend a "tailgate feel" to learning and capitalize on outdoor settings. Once a mobile lab arrives on location, an awning and row of chairs provide the loose structure of a classroom. Students begin their training by watching an instructional video. "Then we do the work we saw on the video. This follow-up field training cements the learning. It sticks in their minds. If they have any questions, we can go back and review the video," says Jon Phelps, energy director, Louisiana Association of Community Action Partnerships (LACAP), Baton Rouge. The outdoor classroom generates excitement among students. They feel free to move around, pick up tools, and try new tasks. The on-site training is an action-oriented alternative to traditional four-wall classrooms. Students do not have the benefit of the many props that fill the stationary training center, but most equipment and processes are depicted on videos. Mr. Phelps praises the benefits of LACAP's well-engineered mobile training lab. "We have everything we need to do the job," he says. Secured cabinets hold and organize equipment and supplies. Diesel generators provide the power for blower door testing, duct blasting, and other diagnostic tasks. 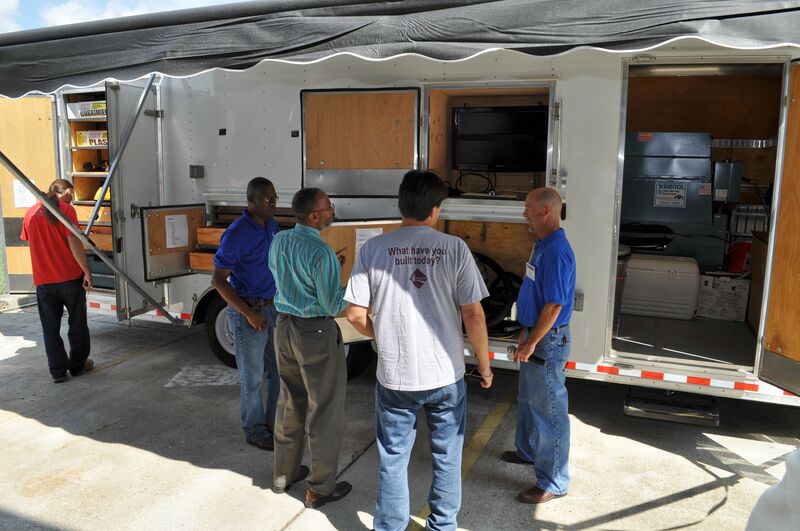 LACAP uses two labs-on-wheels to bring weatherization training to communities across Louisiana and other sites. They are also taken to weatherization conferences and educational or career events. "The mobile training labs attract a lot of attention. People are curious about them and start asking questions about weatherization training," says Mr. Phelps about the shiny trucks and trailers. 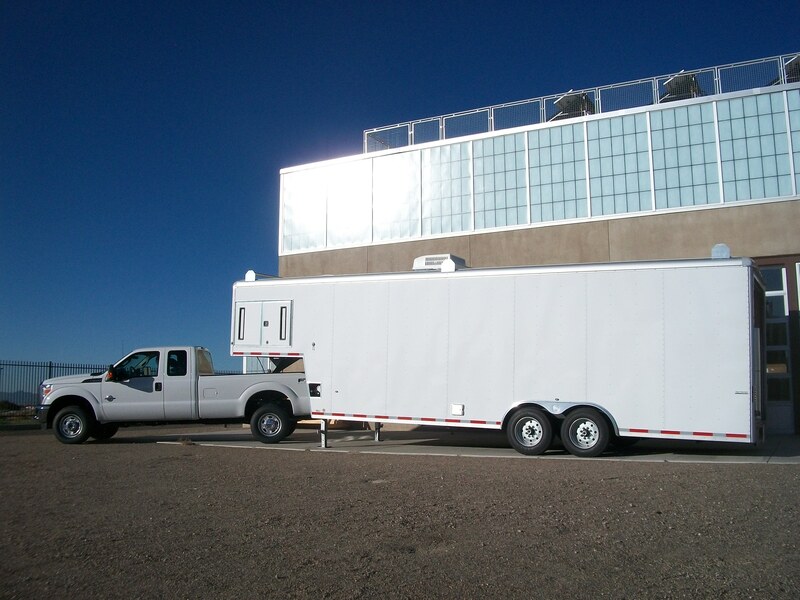 The new mobile training lab, delivered to New Mexico Energy$mart Academy in October, will expand its programs into rural, farming areas, such as Native American communities scattered throughout the state. "Some people may not be able or feel comfortable about coming to Albuquerque or Santa Fe for training," says Bill Eckman, lead trainer at New Mexico Energy$mart Academy in Santa Fe. The mobile training lab will also go to cities, such as Roswell, Carlsbad, and Las Cruces, and present specialized training as requested by groups. As an example, Mr. Eckman describes a planned training for property managers of multifamily structures in Farmington. "We will help them work through the possibilities of using building science to improve their buildings and their energy efficiency," he says. The mobile training lab is equipped to do infrared thermal imaging, combustion testing, blower door testing, and duct blasting. In addition to having all the standard insulation machines, power tools, and hand tools, it has a large, flat-panel screen for showing instructional videos. "We set up an outdoor classroom for students so we can have a full training on site. Class size is usually 5 to 10 students, but we could easily accommodate 20," says Mr. Eckman. Who's the best at sealing ducts or packing insulation? One way to find out: crew competitions. Statewide events stack weatherization workers against each other in different, sometimes very physical contests. A crew competition at the Georgia National Fairgrounds in Perry in late October attracted more than 90 Georgia crew members, coordinators, and directors from 22 weatherization agencies. Crews showcased their knowledge and skills as they performed weatherization tasks and faced other challenges such as the Tight Squeeze. Who fits through the smallest attic access hole? The winner made it through a 9.5-inch opening. "The competitions allow agencies not only to compete, network, and have fun, but participants also learn from the best practices of other agencies and this inspires them to strive toward improving their daily work," says Brad Turner of Southface Energy Institute, Atlanta. Aside from the educational value, the crew competitions build camaraderie and motivate crews to perform better — so they can take home the prize next year! A crew competition and tech fair in Wisconsin attracted 500 participants from 18 different weatherization agencies. "We held many different competitions — from sidewall insulation and attic prep and bypass sealing to energy auditing and final inspection," says Suzanne Harmelink of Wisconsin Energy Conservation Corp., Madison. Photo competitions and the "Weird Stuff Found on the Job" contest provided unique opportunities to share skills and experiences. This interactive event was designed by field staff for field staff to promote excellence and efficiency in Wisconsin's Weatherization Assistance Program. In addition to crew competitions, 22 exhibitor booths demonstrated products, and roundtable discussions and training workshops were held. The event was staged in Wausau in 2010, sponsored by the State of Wisconsin's Division of Energy Services. The next event is scheduled for September 10-13, 2012. Training centers are using screening tests to identify students who may need remedial classes before they begin advanced weatherization courses. "We find the tests have been helpful to us because sometimes people are changing careers, or they've been out of school for a long time," says Michael Stokes, program manager for The WorkPlace, Bridgeport, Connecticut. Students benefit from refresher classes to bring them up to speed. Once they are better prepared, they have a high success rate for completing classes and graduating from the program. The WorkPlace uses a 50-question assessment test to identify gaps in knowledge. The test is given after students have completed Weatherization 101 and 102 but before they move into more advanced training, such as Building Performance Institute (BPI) certification. "Math is the number one issue. It gets a little harder with BPI building analyst training. It's different from the construction math they deal with in the field. They may need to go into math remediation," says Mr. Stokes. "Also, we found some students are lacking in building science background." About 60% of the questions concern building science; the rest are math questions. Students need to answer 80% correctly. If they fall below, they are placed in classes for two or three days to receive remedial instruction. Following completion, instructors give a similar test to see if their scores have improved. Other centers use an adult basic education test to screen all applicants before they enroll in programs. At CCEO Weatherization Assistance Program, Lennox, California, the application process includes tests to measure competency in math and English. Taken online, each test requires about one hour to finish. "We are looking for at least eighth grade math skills and no less than sixth grade English skills. We want to make sure they are ready to go," says Andy Delgado, project director. The weatherization training takes six weeks to complete. Then, students who seek advanced weatherization training are referred to partner schools. If they need assistance in math, they are enrolled in evening classes to raise their math levels. "They are grateful to know there is a resource to assist them," says Mr. Delgado. Go to the site and click the “request access” button to get your user name and password. Click here. Have you accomplished something to improve the weatherization community, or do you have a suggestion for a story? We want to hear from you. You can send your ideas to sam.daugherty@orise.orau.gov. In fall 2012 Montana State University plans to introduce a Certificate of Applied Science in Residential Building Performance to its academic programs. "It will give credits for noncredit training taken at accredited weatherization training centers. Credits will be applied toward a one-year degree," says Lesa Pribyl, program developer, Montana Weatherization Training Center in Bozeman. "Montana State University's weatherization degree program has nationwide access," says Ms. Pribyl. In addition to enrolling in face-to-face training at accredited weatherization training centers across the country, students will take a slate of online courses that do not require them to attend classes in Bozeman. Full-time students can finish in one year; students can elect to attend half time. They can tailor the degree toward individual preferences and select from one of six different tracks. As an example, the multifamily track features courses in multifamily energy auditor and multifamily mechanical systems. The degree prepares students for the four specific DOE energy certifications: retrofit installer technician, energy auditor, quality control inspector, and crew leader. The degree also prepares students for private industry certifications offered through the Environmental Protection Agency (EPA), Occupational Safety and Health Administration (OSHA), Building Performance Institute (BPI), and Residential Energy Services Network (RESNET). Ms. Pribyl expects students from across the country to access the new, one-of-a-kind degree. 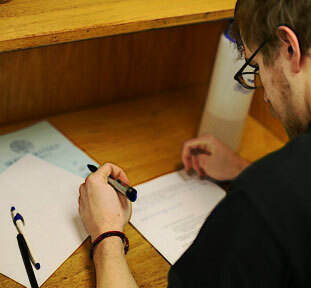 Fourteen students will begin the certificate program in the first year, with subsequent years to have 21 to 30 students. Some students will already be involved in weatherization programs. Others will be small business owners interested in starting an energy auditing, insulation, construction, or remodeling company. The U.S. Department of Labor gives energy auditors and weatherization installers and technicians the rating of "bright outlook." This rating indicates that the occupations are expected to grow rapidly in the next several years, will have large numbers of job openings, or are new and emerging occupations. This initiative is sponsored by the U.S. Department of Energy and has been developed in partnership with weatherization training centers across the country, Montana State University Extension, and Montana State University Gallatin College Programs.